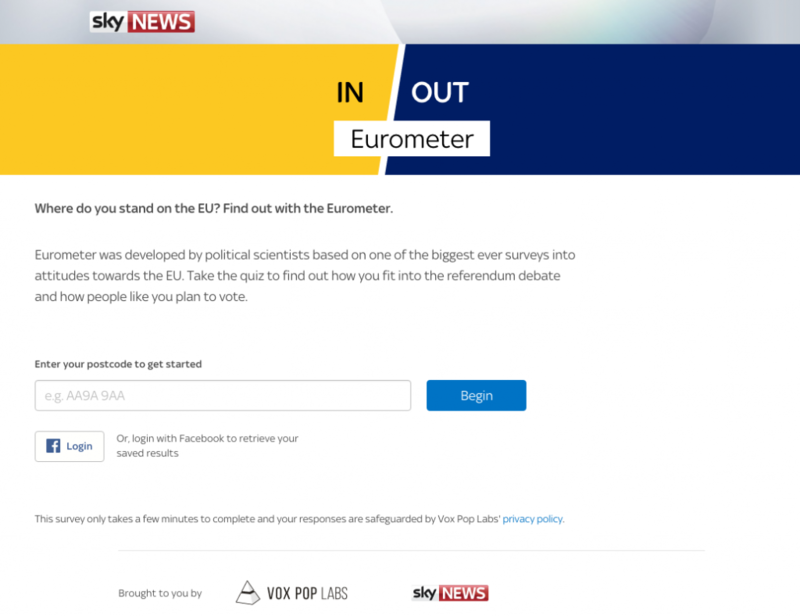 Vox Pop Labs has partnered with Sky News to launch Eurometer ahead of the referendum on the United Kingdom’s membership of the European Union on June 23. Eurometer is an interactive civic engagement platform that surveys users about their views on the upcoming European Union membership referendum and, on the basis of their responses, analyses their fit among seven predetermined archetypes of affinity or antipathy toward the EU derived from a large-scale, UK-wide survey on the subject (see Methodology for details). The Eurometer is not designed as a voting aid or fact check, but rather as a means of helping users situate themselves within the discourse currently taking place within the UK. Entirely non-partisan and independent of the Stay and Leave campaigns, Eurometer is an academic exercise that seeks to foster a constructive and meaningful dialogue about the present and future relationship between the UK and the EU. Eurometer is available online via Sky News. Eurometer is accessible via Sky News at https://eurometer.news.sky.com/.